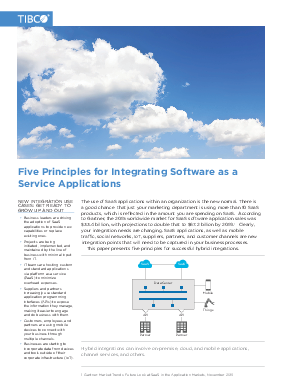 The use of SaaS applications within an organization is the new normal. In fact, there's a good chance that just your marketing department alone is using over 10 SaaS products. According to Gartner, the 2015 worldwide market for SaaS software application sales was $33.4 billion, with projections to double to $67.2 billion by 2019. Integration needs are changing, with SaaS applications, as well as mobile traffic, social networks, IoT, suppliers, partners, and customer channels all new integration points that will need to be captured in your business processes.